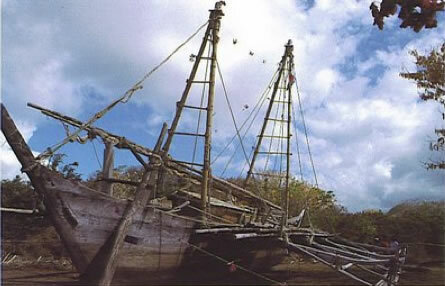 In 1985, Bob Hobman and a crew of six sailors earned a fabulous challenge: crossing the Indian Ocean, from Bali to Madagascar on a bamboo trimaran as did a few thousand years ago.The Sarimanok – (the name of a lucky little bird in South-East Asia) has been constructed according to Neolithic methods (no metal Only organic materials). There were no navigational instruments to use and the sailors relied on stars to guide them. To make the experience more authentic, the crew ate only vegetables.